What makes Social Innovation strong in Canada is the open and supportive learning network of systems change and lab explorers from many walks of life. We are grateful to the people and labs who share their time, learning, tools and support. Never forget networks are far more powerful agents of change than single individuals. We can’t solve complex challenges if we hide in silos, so keep connected and supportive of each other. There is a danger in creating a lab guide that people will attempt to use it as a template or formula to rigidly follow. We often rigidly cling to templates when we fall for the allure of hoping to find silver bullet solutions, tools and processes to solve complex problems. The tricky thing is, the more the uncertainty and complexity, the more we can find ourselves getting overwhelmed and insisting on rigid answers. Be aware and careful of this very human tendency to insist on simple truths and answers when we’re facing the messiness and overwhelm of wicked problems. 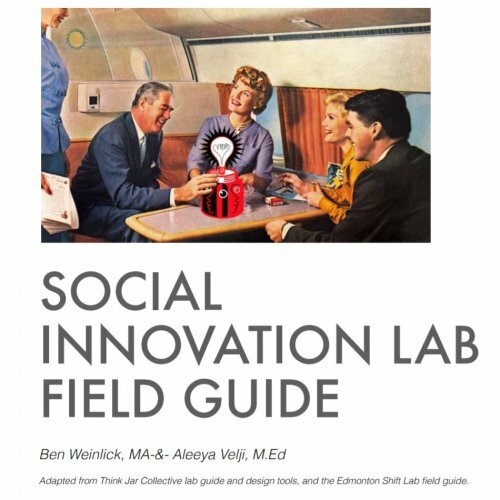 The truth is, the field of social innovation labs is still a pioneering and emerging discipline where there is much room for experimentation and many sided approaches. No person or group has found a formula that works consistently in all situations to make positive systemic impact around complex challenges. That said, a general direction to start with is helpful or we’ll get overwhelmed by complexity and do nothing or simply revert back to business as usual approaches to solution finding. Usually people and collectives want to launch a social innovation lab because business as usual approaches on their own are not working to make progress. A Systems Thinking Lens gives a “birds eye” view of the complex dynamics of a challenge and a Human Centered Design Lens offers a “worms eye view” of what’s going on with the challenge on the ground with people - Both are needed.